Painting Wood Floors | Your home, only better. Looking to make a BIG change? Ready to stir things up a bit? How about painting your wood floor? For me, this fits the category of “I’d love to do it, but don’t think I can gain spousal consent.” Yes, it’s a bigger job than painting a wall, or even a ceiling. But if your wood floors have seen better days, a bit of creativity might just do the trick. The look can range from warm country with classic diamonds on a wood floor to playful contemporary with a bold color and high gloss. And for the artistically bold among us, the possibilities are endless. Lets start with one that most of us can relate to (from Coastal Living Magazine). 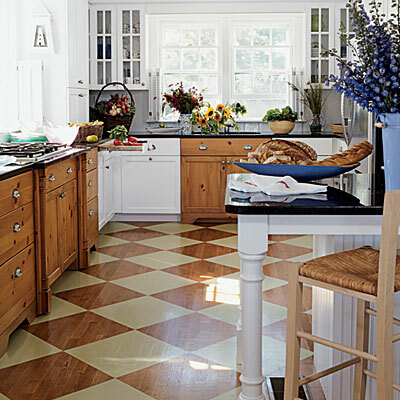 Yes, it’s a bold painting maneuver, but it’s done in a classic way that screams “I’m traditional, but I’ve got some unanticipated sass in me!” Imagine what this can do for your tired kitchen floor! Works well with black or brown diamonds too. Or, if you prefer stripes over diamonds, here’s another simple design that plays safely in the background using a staining technique. Angling stripes adds a bit of whimsy to an otherwise symmetrical living room. Love the punch of orange, by the way! 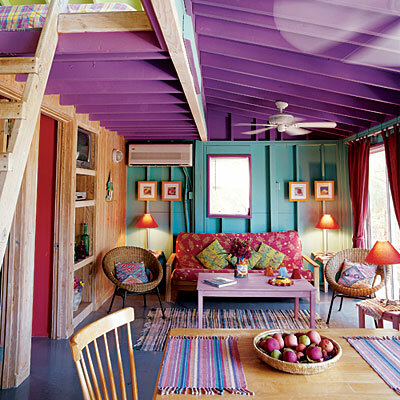 Here’s a simple example of infusing color into an otherwise uncomplicated room. It gives it just enough personality without being in your face. 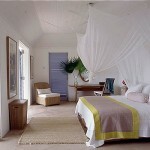 Now if you’re of the bolder persuasion, why limit your love for color to the walls and ceilings? I love the energy in this photo (Coastal Living Magazine). Granted this may look odd in a New England colonial, but if your house has the bones for it and you’ve got the kahunas…go for it! Here’s another one from Coastal Living magazine that turns an otherwise ho-hum floor into a work of art and adds just the right amount of beachy feel to this room. Love the chalkboard and lime green doors too! If you’re not ready to commit to painting a floor, why not start with the stairs? This is a simple example from Real Simple magazine that shows what a nice pop of color can do to spice things up. Toys on the steps are optional (a bit of a hazard, actually). Ready to go one step further? (Sorry, pun intended). 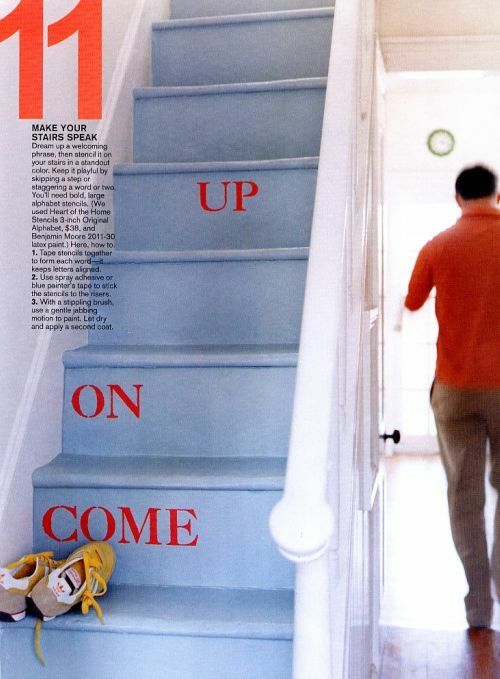 Paint your stairs then make them your own with a bit of verbal flair.You could also just number the stairs going up. Great way to teach kids to count! 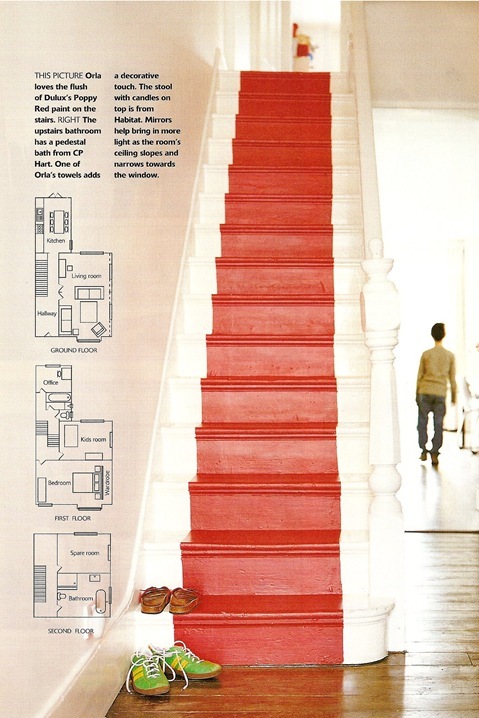 Make a dramatic statement by painting a red runner down the stairs. It’s a simple yet elegant décor element that really pops against a white canvase. LOVE it. Or, if you’d rather tone it down a bit, how about painting just the tops of the steps? Ok, as promised, here’s a handy how-to guide – a compilation of all the advice I’ve researched (remember, I haven’t actually done this yet). Primer – Depending on the condition of your floors, you may want to first roll a coat of wood primer before you paint. Suggestion? Try Zinsser 1-2-3 Plus Primer. Paint – Use a Latex Enamel porch and floor paint. Suggestion? 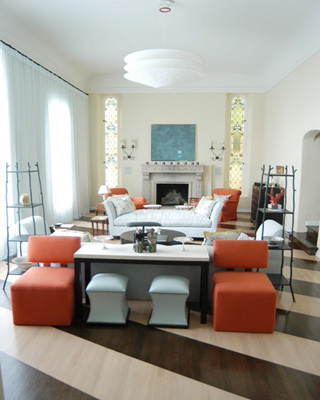 Try Benjamin Moore Floor & Patio Latex Enamel. Sand your floor – either just the part you will be painting, or if the whole kit and kaboodle are getting the treatment, do yourself a favor and rent an orbital sander. And please, wear protective goggles and a face mask! And so you don’t have to do it again, seal off the room as best you can. If you’re painting a design, tape your pattern and fill the areas in with a small roller. Be sure to remove the tape before the paint is completely dry. Trim the edges with your trim brush, then use a ¼ inch roller and apply two thin coats – and wait 24 – 35 hours between coats. If you used the right paint, you should not need to seal it. But if it’s a high-traffic area, you might want to finish it off with a coat of clear water-base polyurethane to protect it. There ya go! Now that is doable, right? If you could paint any floor in your home, which room would it be and what would you do? And if you HAVE done this before, any other tips we should add? Thanks for listening – 100th Post! From next week i’m gonna lose weight. Summer is comming girls! 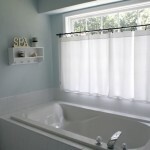 These projects are fantastic and they really showcase just what floor paint can do you for your rooms and your house. What an enviable look. I did this in a dining room about six years ago. Have since sold the house. It was an unexpected accent to a new builder-stock house. Gave the room instant age which we loved. Like everyone else has said, you must seal the paint. My floor chipped in several places requiring us to fix it a few times. Next time I will use a stain instead. Think it might be less prone to chipping. A few years ago, I saw Lisa Laporta on “Designed to Sell” use a dark deck stain on hardwood floors. They didn’t have time to sand, stain, and seal. The floors looked really nice in the end. Has anyone ever heard of doing this? I noticed that my back porch wood floor paint was holding up remarkably well- three years old and there is not a worn spot or chip on the entire porch, even the steps. So I decided to use the very same paint on my interior hardwood- Sherwin Williams latex porch and floor paint. I rented a sander, sanded my living room, dining room, and hallway and painted it. I will use no poly- if I have any issues anywhere I can sand and repaint in no time. I LOVE it. I am so over the worship of hardwood that I had to do this to make a statement and am so happy I had the nerve to do it! I don’t have wood floors in my office, I’ve tried to contact you before via email but could not reach you. I need to know if these paints are easily cleanable, if that is so then I need to know what you offer me for my office and floors. Wow! I never thought of painting my wood floors. I have a rental with some hardwood floors that are in rough shape (animal stains and who knows what else) and I figured I was gonna be due for sanding and re-staining the floor. This looks to be ideal. I painted and sealed a kitchen floor about 10 years ago. After several years the polyurathane wore through in small areas where we walked often. This meant the paint was exposed and then this wore though so you could see the wood. You could see that the polyurathane had yellowed so it was impossible to recoat the wood to match the polyurathaned surface. I have recoated the polyurthane with a special undercoat that sticks to shiny surfaces. I’m going to paint the floor with 3 coats of gloss paint and not seal it. When it starts to look worn in places I will touch up the worn areas. Also don’t use a waterbased polyurathane. My sister tried it and it lifted off the floor when she washed it. We bought a house about four years ago; it’s now 107 years old, and has of course been updated in various ways. The people who sold the house to us had put some inexpensive carpet upstairs, which I wanted to tear out, but we had other priorities first. Now the carpet is looking atrocious, but when we pulled it up around the edges, we learned that there is plywood underneath it. We cannot afford to buy quality hardwood flooring at this point in time, and I like the idea of painted wood floors. Would there be any was to apply some sort of surface to the plywood that could then be painted? There are many sure fire ways of making floors interesting in a creative way. The flooring industry has a lot of products available and floor service providers are within reach if you lack time to do-it-yourself. Floors are an investment and every possible solution in making the flooring become better is definitely welcome. Thanks! My husband has been wanting to paint out hardwood floors that we discoverd under the carpet in the home we are remodeling. Now I will say yes! Painting a floor takes time rather than painting ceiling or wall. I can’t imaging me doing the job while giving it designing also. whew! I love the picture from ‘Real Simple’. 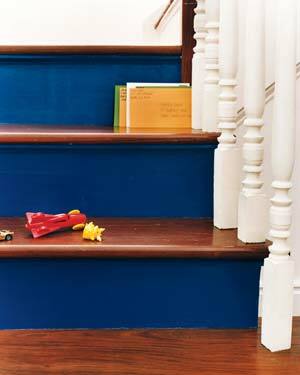 The blue paint surprisingly went well with the red hardwood stairs, in fact – the contrast makes it look even better. 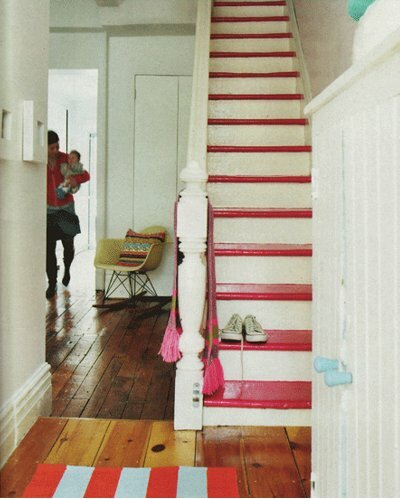 I wonder if candy pink would look great with maple flooring. Love the chalkboard and lime green doors too! Just started painting floors in my older home. On my third room and decided to paint it a darker color but may have to do it again in a lighter color as I feel the room looks way too dark. Any suggestions how I can lighten this up without repainting the whole room. I already painted the walls a chocolate milk color so painting the walls is not a option. Help! You can lighten it up with either light colored area rugs or paint the floor with some stencils, or diamonds or some other design, with a lighter paint! WOW.Very beautiful! Good design. I love it. I really want to see that place. I would love to paint a floor in my home, but haven’t been able to secure spousal consent. darn. So I am contemplating ripping up the carpet and doing this…just one thing. Our house is very old and the floor has white paint on it….most likely lead paint. What special precautions should I take? Also, I have four little boys who would probably find their way into this room. Can I use a shellac over the paint so I won’t have to evacuate the house after I put the poly down? Okay, very interesting. I was almost shocked to hear that you would paint a beautiful hardwood floor, but after looking at the great photo’s taken by the photographer I quickly realized it could be very fun to paint the hardwood floors. A Dust Free sander is recommended for sanding purposes. Having a professional come and and sand your floors is not to terribly expensive. I will have to make this a discussion in the office about painting floors. The input from the craftsman and the boss should be extremely interesting input. 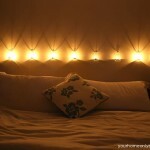 Great photo’s and informative do it yourself information. .-= ProSand Flooring Construction´s last blog ..Audio Solutions =-. Thing is, mostly they are not “lovely hardwood floors” but bog standard pine floorboards and if they are old enough, tend to be orange. No loss there. Hi Designer – I’m partial to the stripes as well! Hey Moon – never go with neighborhood consensus! 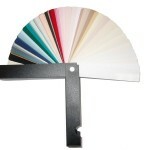 What color is your wood ceiling now? If it’s natural wood color, my vote is to paint it white, but then again I just told you not to listen to your neighbors – lol! Hmmm. Not sure about that purple painted ceiling. My partner and I have this ongoing debate about whether or not we should paint our wooden ceiling white. I say no but he says yes. The entire neighborhood has an opinion! 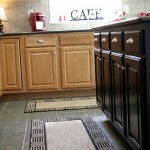 Great flooring options! What a punch to a room! I love the stripes the most but all the ideas are great and inspiring. These are such fun, but I’m like you, spousal consent definitely would not be forthcoming. In fact, I just showed Beloved Husband that pic with the purple ceiling and turquoise wall; his response definitely is not printable here!! Yes, the blue room is by far the most practical! Although I really want to try the first one w/the cream diamonds. Awesome pictures – very inspirational! 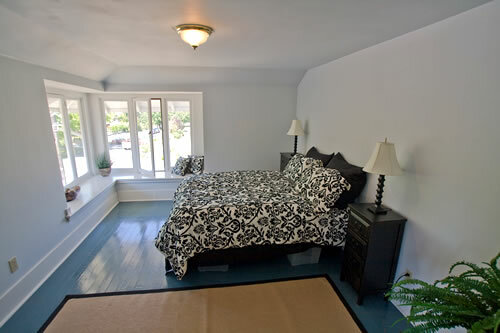 I love the blue bedroom floor photo the best, that is something I can picture in my home. The others are real eye candy too, but I think they would get old for me pretty fast. I just wanted to add that when you paint a design, sealing is not optional, it’s a MUST! Without it, the edges will chip off, no matter what paint you used.